Provence is yet another of those regions that is often thought of in one general way and also associated with a particular type of wine; rosé. Like so many other regions it is impossible to think of this region as one thing, because it is not only very large (one of the largest in France), but extremely diverse in terms of micro-climates, soil types, aspects and altitudes. Wine styles can differ, as can philosophies about the making of the wine. Many of the vineyards of Provence are individual growers who are part of a cooperative, which at the moment is churning out very simple, thin and watery rosé which is fuelling a very large global market for refreshing aperitif wine that can be served very cold, sometimes with an ice-cube. Whilst this type of wine may be reflective of the market in general, and a reflection of the warm weather enjoyed in this part of Europe, it is not necessarily reflective of the many parts of Provence. From the coast to the forest-covered mountains, Provence has the potential to produce a great range of wines, from as many different varieties. A number of smaller producers are committed to this, and several appelations have sprung up in the last 50 years, two of which I visited today to learn more. Of all the appelations in Provence, the Bandol AOC has the biggest cult following at the moment. It is a relatively small area not far from Toulon that covers about 1,500 hectares of vineyards. The most important red grape variety here is mouvedre, and the appellation dictates that at least 30% of rosé wines must be mouvedre, and for red wines it must be at least 51%. 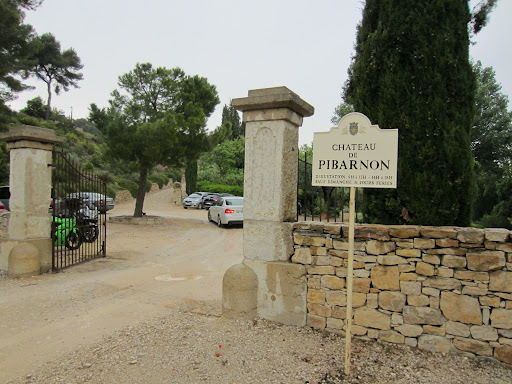 The owners of Chateau Pibarnon are another of those families who simply fell in love with the area and the wines when they visited from northern France, and decided to have a sea-change and establish their own winery. 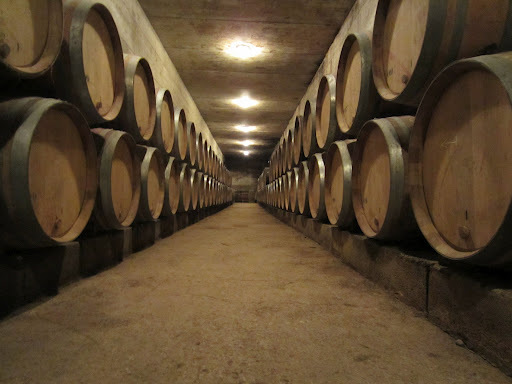 In 40 years they have become the most important winery in the region, and it has been through foresight and insight. The estate is tucked away in a valley about 20 km off the coast, shielded from a lot of the winds and chills of the Mediterranean. The 40+ hectares of vineyards are planted in a number of areas on terraces, and there are now over 200 separate parcels they work with. They are clearly committed to the mouvedre grape, as 95% of their vines are planted to it. 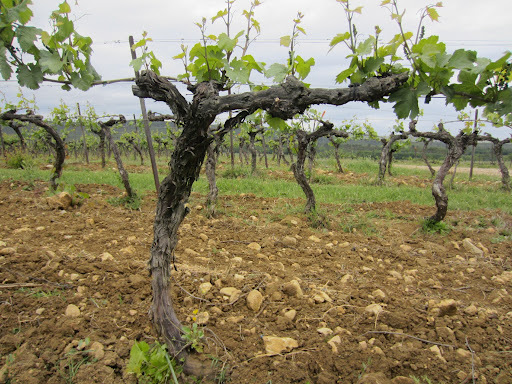 Most of the mouvedre is planted on south-facing slopes, as it is a variety which ripens later and needs a little more attention and sun to reach maturity. Within their unique amphitheatre vineyards there are both red and white varieties that don’t have as much difficulty ripening, and would be better to ripen a bit slower with a northern aspect. All varieties are treated separately, fermented and matured as necessary. Unfortunately I didn’t see the winery and wasn’t really explained the winemaking procedures for the reds, but for the rosé and white wines a gentle press is followed by up to 30 minutes skin contact to extract a small amount of colour and texture, before the juice is fermented in stainless steel tanks. The winery only makes four wines; the white wine, rosé wine, and two red wines, and the sales manager Jean Simonet took me through part of the range. Click here to read my notes. Domaine de Triennes was created in 1990 by two giants of Burgundy – Aubert de Villaine and from Jacques Seysses, founder of Domaine Dujac – and a Parisian friend Michel Macaux. They were convinced of the immense potential for Provence to produce world-class wines, and finally settled at the estate in the Var appellation. The cool-climate up in the hills 30km from the coast, the sloping aspects and the clay and limestone all offered great resources to craft exceptional wine. From the beginning the vineyards were designed specifically to make the most of the terroir, and were managed in a sustainable organic methodology. A range of varieties have been planted and replanted over time, varieties both native to Provence and introduced from other French regions. The harvest usually begins at least three weeks later here than in areas closer to the coast, due to the altitude and subsequent cooler climate. The fruit is very carefully handled in the vineyards and in the winery, where harvesting at night and at cool temperatures captures the freshness and essence of the site. The white wines are completely fermented and stabilised in stainless steel with the exception of the chardonnay, which like the red wines sees some oak, but only barriques from Dujac that have been used for at least two passages. Most of the wines are blends of varieties, but a few are single varietal wines. I was shown around the estate by winemaker Remy Laugier, who took me through a range of the wines that he is responsible for. Click here to read the tasting notes. Click here to see more photos from Day Two in Provence, France. Next week I venture north into the Rhone Valley, starting with the illustrious Chateauneuf-du-Pape.